Looking for a clock for your fireplace mantel? Seth Thomas Clocks have adorned mantels for generations. There was a time when almost every home in America had a mantel clock over the fireplace. That's because wristwatches hadn't been invented yet. The fireplace was often the central meeting place of the home. It was in the great room that the family members spun wool and carved items, while mothers cooked dinner. It was a convenient location to put the only timepiece the family had. The loud chimes would announce the hour throughout the home. Seth Thomas clocks have been some of the most popular mantel clocks for hundreds of years. Today each family member usually has the time on them, but the tradition of the mantle clock continues. My husband and I are rehabbing an old farmhouse on the coast of Maine and we have kept all of the rooms small. Each one has a fireplace with a mantel. 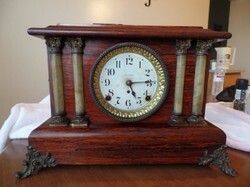 I have been scouring local antique shops and eBay for mantel clocks that will fit the decor of each room. I often find old, rare or antique Seth Thomas clocks. Some are simple wood finishes, other's have decorative finishes that look like marble and some have beautiful mental embellishments. Each clock is so distinctive it should be considered a work of art. I love buying antique mantel clocks because they fit the house and they should appreciate in value. One thing that I am careful about is the amount of restoration that has been done on a clock. It's better to have scratches in the original finish than a repainted Seth Thomas clock. Of course if I really love a restored antique clock, I buy it anyway. I just know it probably won't help the retirement fund. You also have to make sure that any repairs to a Seth Thomas clock are made using authentic clock mechanisms from the factory. Each part should be inscribed with the name Seth Thomas. If you are selling your clock to a knowledgeable antique dealer this is one of the first things that they will check. Having rogue parts in a Seth Thomas clock will devalue it more than any other factor. That's because that's where you find the Seth Thomas craftsmanship that will make the clock keep time. If a clock can't do that, then it's just a decorative sculpture. There is an art to keeping an antique clock chiming on the hour and half hour. I know have 6 old clocks that chime on the hour. I love it when they all begin to ring with their distinctive chimes. Some of my guests find it disconcerting,but they adjust or decide to spend their next visit at a nearby bed and breakfast. My grandmother collected clocks. Sadly they are mostly all gone now. I come from a family of striking clock owners. My grandparents' antique Victorian grandfather clock is at least 8 feet tall and strikes the hour still, despite having moved several times from his original home. I grew up with this clock outside my room at their house, and he still sits outside the room my husband and I use at my parents'. They also have a grandmother clock in the dining room, which chimes more sweetly than Grandpa upstairs. I have a Westminster mantle clock, nicknamed Gramps, which my grandparents were given as a wedding gift. He needs to be repaired, unlike Junior, my modern Westminster chimer which just needs winding later because he's stopped! These are beautiful clocks, which they don't make any more. I love these classic mantle clocks. Sunflower clocks add sunny cheerfulness to any room and complement traditional country decor. Here's a great selection at affordable prices. Give any window instant glamor with a stained glass sun catcher. Here's a beautiful selection featuring butterflies, birds, even lighthouses.